David L. Clark, recipient of the 2017 Glenn T. Seaborg Award for Nuclear Chemistry from the American Chemistry Society. Photo credit: Rod Searcey, Stanford, Calif.
LOS ALAMOS, N.M., Aug. 22, 2016—Los Alamos National Laboratory chemist David L. Clark has been selected as the 2017 recipient of the Glenn T. Seaborg Award for Nuclear Chemistry, sponsored by the American Chemical Society Division of Nuclear Chemistry and Technology. “Dave is well-known for his breadth of accomplishment in actinide synthesis, characterization, and electronic structure elucidation, as well as the development of modern multi-method approaches to the characterization of complex actinide behaviors,” said Alan Bishop, Principal Associate Director of the Laboratory’s Science, Technology and Engineering directorate. 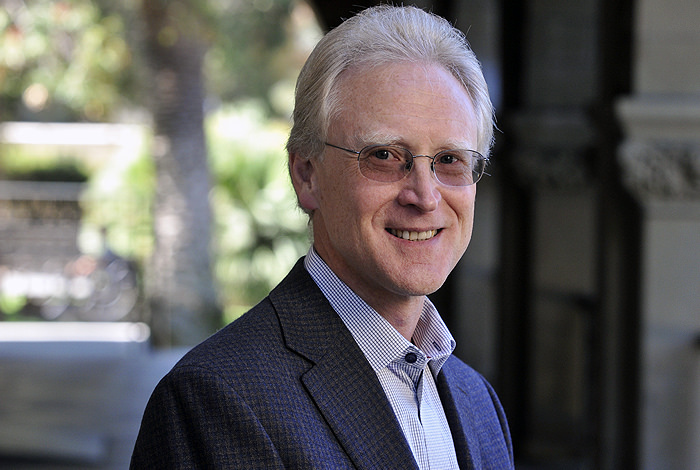 Clark was honored for his innovative systematic studies of the fundamental chemistry of actinide elements using novel experimental techniques and giving new insights into chemical bonding of 5f electrons. “None of this research would have been possible without my outstanding colleagues and collaborators. This honor is a tribute to them. I am also grateful to Los Alamos, where I have had access not only to great colleagues, but to unique facilities and an institution with a rich history in nuclear chemistry and research scholarship,” said Clark. Los Alamos scientists have studied actinides, the 15 metallic elements from actinium to lawrencium on the periodic table—since the production and subsequent chemical separation of plutonium during the Manhattan Project in the 1940s. The award recognizes outstanding contributions to nuclear chemistry or radiochemistry or to their applications. The August 22, 2016 issue of Chemical & Engineering News includes the formal announcement of the names of the 2017 ACS National Award Recipients. The American Chemical Society, the largest scientific society in the world, will present Clark with the award at the Society’s 253rd ACS National Meeting & Exposition in San Francisco, Calif. on April 4, 2017. Currently, Clark is the director of the National Security Education Center within the Science, Technology and Engineering directorate of Los Alamos. Clark is an internationally recognized authority on the chemistry and physics of radioactive actinide elements, with an emphasis on plutonium. He has published more than 165 peer-reviewed publications with nearly 7,000 citations. Clark is widely regarded for his efforts to bring state-of-the-art molecular-level understanding to the chemistry of the actinides and to apply that understanding to unravel the behavior of actinide ions in chemical solutions or the environment. Those efforts were applied to the original scientific case for the Waste Isolation Pilot Plant (WIPP) and to the environmental cleanup of the Rocky Flats Site. Most recently, he turned his attention to chemical bonding and the use of x-ray spectroscopy at synchrotron light sources to study the role of 5f electrons in chemical bonding. Clark is dedicated to the education and training of others in actinide science. He was the inaugural director of Los Alamos’ Glenn T. Seaborg Institute, and he developed the institute’s postdoc and student summer school programs. At the Laboratory, Clark received the Fellow’s Prize in 2000, and he was named a Laboratory Fellow in 2001. He was named a Fellow of the American Association for the Advancement of Science in 2005, and he has received two NNSA Defense Programs Awards of Excellence in 2006 and 2008. This is Clark’s second national-level American Chemical Society award, the first being the Nobel Laureate Signature Award in Graduate Education in Chemistry, awarded in 1988 for his Ph.D. thesis work. David Clark received a B.S. in chemistry from the University of Washington and a Ph.D. in inorganic chemistry from Indiana University. He was a postdoctoral fellow at the University of Oxford before joining Los Alamos National Laboratory as a J. Robert Oppenheimer Fellow in 1988. He became a Technical Staff Member in the Isotope and Nuclear Chemistry Division in 1989. Clark has held various leadership positions at the Laboratory, including program management for Nuclear Weapons and Office of Science programs and Director of the Glenn T. Seaborg Institute for Transactinium Science (1997-2009). He has served the U.S. Department of Energy as a technical advisor for environmental stewardship including the Rocky Flats cleanup and closure (1995-2005), closure of High Level Waste tanks at the Savannah River Site (2011), the DOE High Level Waste Corporate Board (2009-2011) and DOE’s Environmental Management Technical Expert Group (2011-2012). Currently Clark is director of the Lab’s National Security Education Center and leads the Plutonium Science and Research Strategy for Los Alamos. The American Chemical Society’s Division of Nuclear Chemistry and Technology presents the Glenn T. Seaborg Award for Nuclear Chemistry to recognize and encourage research in nuclear and radiochemistry or their applications. Previous recipients from Los Alamos include Arthur C. Wahl and Darleane C. Hoffman. More information about the Glenn T. Seaborg Award.